Basic education and literacy are essential for reducing poverty, improving health, encouraging community and economic development, and promoting peace. Over the years, we’ve helped make significant progress towards helping achieve the United Nationals Millennium Development Goals, especially within the basic education and literacy area of focus. According to a 2014 progress report, literacy rates among adults and youth continue to rise and the gender gap in literacy is narrowing. In partnership with local government, community, and international clubs, the Rotary Club of Tagum North, Davao City, Philippines, reconstructed classrooms at the Imelda Daycare Center damaged by Typhoon Pablo. The Rotary Club of Latur Mid-Town, Maharashtra, India, hosted teacher training workshops for educators who work in small rural government-operated schools. 213 teachers received six hours of coursework on new educational technologies and applications available to the teachers. 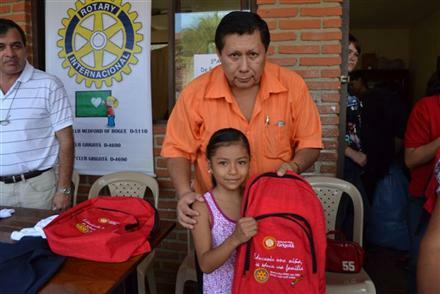 The Rotary Club of Grigota, Bolivia, undertook an advocacy initiative to inform families on the importance of children, especially girls, receiving a basic level of education before beginning to work. The Rotaract Club of Baker College Muskegon, MI, USA, participated in a literacy board game tournament to raise funds for its reading program. Proceeds from the fundraiser supported READ Muskegon, a volunteer one-on-one tutoring program for adults who want to improve their literacy skills. Working with local Rotary and Rotaract clubs and the Ministry of Education, the Rotary Club of Solo Kartini, Indonesia, organized a Literacy Day event where hundreds of high school students read and reviewed a preselected book. The event celebrated literacy and honored the 20 best literary reviews. Working with the local municipality, partnering Interact club, and sponsoring Rotary club, the Rotaract Club of Izmir-Alsancak, Turkey, created mobile libraries to provide books in three low-income communities in Turkey. While we’re making progress, there’s still much work left to be done. Pressing global concerns still remain: 58 million children worldwide are out of school while 781 million adults are illiterate[i]. Imagine: if all students in low-income countries left school with basic reading skills, 171 million people could be lifted out of poverty equaling a 12% reduction in global poverty[ii]. Throughout the month of September, encourage fellow Rotary members to check back here for tips, resources, and inspirational success stories to help plan club and district literacy projects. Add your voice to the conversation using the blog’s commenting feature and share how your club supports basic education and literacy initiatives on Rotary Showcase.